Current theories peg the origin of flight as happening one of two ways: either feathers helped creatures glide from branches safely to the ground, and adaptation eventually built that into flight; or else it helped their running speed so much that eventually they got fast enough to take off. By strapping wings to a six-legged robot, researchers have found evidence that it's more likely the former than latter, and have also managed to make a very cool little bot. This is DASH — Dynamic Autonomous Sprawled Hexapod — and it has six legs, is 10cm long, weighs only 25g, and is constructed from off the shelf parts. 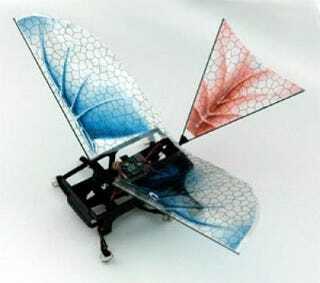 Researchers equipped it with flapping wings and a stabilizing tail, transforming it into a running robot much better able to handle difficult terrain. With these in place, it all but doubled its running speed going from 0.68 m/s to 1.29 m/s. It also managed to climb much steeper hills, and was able to control its descent and land upright when it fell off objects. More than just an incredibly cool little robot which will doubtless overrun store shelves in a couple of years, DASH gives us hints about the evolutionary path that wings may have arisen from. While the speed boost they gave was substantial, it's nowhere near fast enough to give liftoff, and the advantage might not be enough account for the evolution of flight. "We believe that this result lends indirect support to the theory that avian flight evolved from tree-dwelling animals, and not from land animals that required ground-based running take offs," said Kevin Peterson, lead author of the DASH study. It's hardly an iron-clad conclusion, but still an intriguing hypothesis. The researchers also believe that these robots could have great potential for search and rescue, reconnaissance, exploring hazardous areas, and more. I just want one to launch off my desk to annoy any nearby household animals.